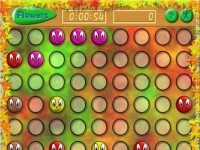 The are many color-lines puzzle games available for free, BonusBall is one of them. It is suitable for all ages and will challenge you to think harder to solve the puzzle. The main goal of BonusBall is to get many scores by positioning minimum of 5 balls of one color in line horizontally, vertically, or diagonally. Random balls will appear once you move a ball. The ball can be moved many steps as long as there is no ball blocking the path to destination cell.